■ Laparoscopic adrenalectomy has become the standard surgical approach for most surgically correctable disorders of the adrenal gland. ■ Aldosteronomas may be considered as lesions of choice for surgeons early in the operative learning curve. ■ Unilateral laparoscopic adrenalectomy is the treatment of choice for patients with Cushing's syndrome due to unilateral adrenal adenomas. ■ After initial controversy, laparoscopic adrenalectomy for pheochromocytoma is now well accepted as a standard indication for unilateral or bilateral disease. ■ The quintessential objective during laparoscopic adrenalectomy is early control of the adrenal vein and in this regard, pheochromocytomas are best suited to the transperitoneal approach. ■ Masses demonstrating local organ invasion or venous tumor thrombus are not suitable for laparoscopic resection because the ability to achieve an adequate en-bloc resection is extremely difficult in this setting. ■ Early access to the adrenal vein prior to manipulation of the adrenal gland or periadrenal tissue is the main advantage of the lateral transperitoneal route. ■ The posterior retroperitoneal approach utilizes the prone jack-knife position. In addition to the advantages and disadvantages of the retroperitoneal approach, it also allows access to both glands for bilateral procedures. ■ Tumor size, obesity, and the learning curve are the most important factors influencing operative outcome. 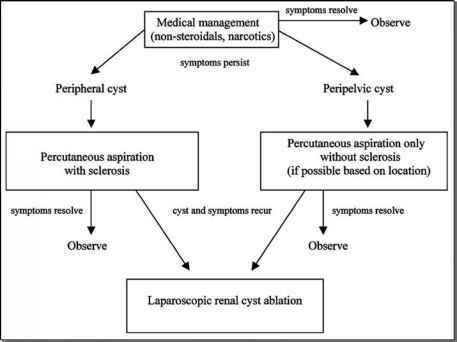 ■ The aim of a right-sided laparoscopic adrenalectomy is to remove the adrenal gland with early ligation of the adrenal vein. It is essentially a dissection of the inferior vena cava. ■ The aim of a left-sided laparoscopic adrenalectomy is to remove the adrenal gland and periadrenal fat with early ligation of the adrenal vein. It is essentially a dissection of the left renal vein. ■ At all times, patient safety is paramount, and it is essential that the practitioner has a low threshold for open conversion to control significant hemorrhage. An experienced human assistant familiar with the modus operandi of the primary surgeon will provide a dynamic view of the object of interest in a much more expedient fashion than a voice-activated robot, particularly during complex maneuvers such as intracorpo-real suturing.